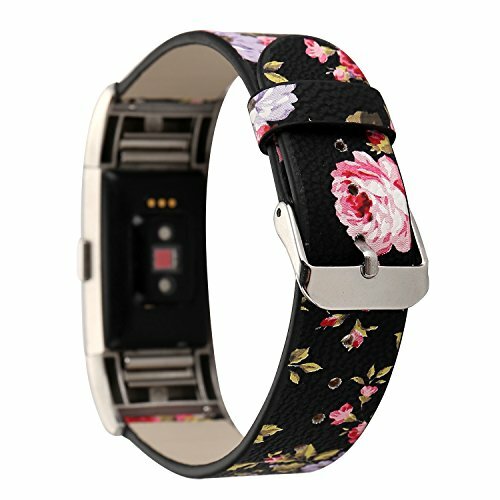 This floral watch band is designed for Fitbit Charge 2, not for Fitbit Charge, Charge HR or other Fitbit models. Flower printed band wide: 18mm; Adjustable length from 5.2''-7.8'', perfect gift for women and girls. But some customers feedback that it may be a little longer for small wrist. Easy to install without any tools. Precise cut holes to fit well for most wrist. Personalize your beloved Fitbit Charge 2 smartwatch with this beautiful leather band. Package includes 1 replacement strap. The real color and style of this item may be slightly different from the pictures shown on the website due to different batches of leather. If you have any questions about this product by MagicFeel, contact us by completing and submitting the form below. If you are looking for a specif part number, please include it with your message.